Guest reviewer Fred Howard is a physician as well as an ordained minister. He recently authored Transforming Faith: Stories of Change from a Lifelong Spiritual Seeker, a searching personal consideration of the stages of faith development work pioneered by James Fowler and Scott Peck. As such, he is quite familiar with the stage theory of spiritual growth that Margaret Placentra Johnston delves into so poignantly and beautifully in her work, Faith Beyond Belief. In Mary Engelbreit’s famous quote, “If you can’t change it, change the way you think about it,” there is the tantalizing suggestion that if we change our way of thinking, then things will change. Margaret Placentra Johnston’s book, Faith Beyond Belief, gives readers a clear, concise framework for the process of spiritual growth and development that can change the way we think about it. Johnston, a spiritual guide as well as a practicing optometrist, brings the lens of spiritual development theory to bear on her own journey as well as those of ten individuals that took the courageous steps necessary to embrace a more meaningful and fulfilling existence. Her easy, conversational writing style gives us a soul’s eye view of their ten touching and sometimes tragic stories. Being a lay person herself, Johnston brings a focus to the stories in ways that allow most any thoughtful and reflective person to find something of themselves in them. Her theory describes four stages: Lawless, Faithful, Rational, and Post Critical or Mystic. In the second set of stories, we learn about six people that continued the process of spiritual development beyond the intellectual integrity of the Rational stage to the more inclusive, universal worldview of the Mystic stage. These are stories of everyday mystics, unremarkable people that see life in remarkable ways – as a mystery, as something to be cherished, as something to be lived in grateful service to others. Each of these individuals exemplifies at least one of the traits of this stage. Each has somehow transcended their indifferent circumstances to lead lives of grace, meaning, and purpose. Johnston tackles this vital yet difficult subject with commendable tact and respect. Women and men of any faith tradition or no faith tradition at all should be able to find wisdom in these pages. The book resonates as both well-reasoned and intuitively on target as a way for us to make more sense of our spiritual journey. What the author is really talking about is growing up – growing out of the narrow belief systems and creeds that religious communities often use to define themselves and growing into more mature ways of being with others and into ways of better serving our diverse world. Every once in a while, a book comes along that can change everything we think we can’t change. Change the way we think about the development of our spirit. Change our life. Perhaps in some small way even change the world. For our times, this is that book. Faith Beyond Belief is a gift! FRED: Why did you feel it important to write a book illustrating the spiritual development concept? MARGARET: Well, Fred, I am going to take that question in two ways. First, why did I choose to illustrate the concept? I thought using real stories about actual people transitioning through the stages would introduce readers to the theory, and let them recognize how much of what goes on in life can be explained by these stages. And I hoped it would inspire people to read some of the deeper texts. Spiritual development takes like an hour to read about, but the better part of a lifetime to understand. I thought the stories would serve as a great introduction. Secondly, I will respond to why I thought it was important for people to learn about the stages. People are gong through shifts in their beliefs. No longer does the average person grow up in a closed community where just about everyone belongs to the same church and believes the same thing. People who are inclined to begin questioning the dogma they were taught as a child may fear there is something wrong with them, may become isolated. Parents whose children are leaving the fold may worry, or try to bring the person back to church. If people only understood that the questioning (or Rational) stage is a necessary step in spiritual maturity, people going through it would be spared the suffering. Moreover, they could be encouraged instead of held back by more conventional forces. Also, it is important to understand the spiritual journey, because some claim our whole society in general is going through roughly the same stages that happen at the individual level. The Enlightenment corresponded to the Rational/questioning stage. We are now in maximum chaos because the old values are being put into question, and things can look really scary. Understanding the Post-Critical or Mystic Stage (or what you [Fred Howard] call the Holistic stage) at the individual level gives us a glimpse of what our society is growing into next, in a post-modern age. The stages allow us to face the scary societal changes in full faith that something better is coming next. FRED: Are you saying religion will die out? MARGARET: Not at all. I am saying that, as our culture evolves, our understanding of religion must evolve with it, or be rendered irrelevant. People are running into issues of cognitive dissonance when comparing the findings of science against the truth claims of religion – the Book of Genesis, for example. It becomes obvious that a lot of the claims made by our traditional religions cannot be true in a literal sense. Yet, every culture in every part of the world since the beginning of time has sought some way of meeting what turns out to be a universal human need – the desire to connect with something larger than the self. By comparing one religion against another we begin to glimpse a bigger story – that each individual religion represents the attempt of one culture to meet that need to connect. That final stage of spiritual development brings a person to understand kind of the same perspective: all religions contain truth, but just not in a literal sense. Spiritual development lets us begin to glimpse a much bigger story about spirituality than any given religion teaches. It is time we let that bigger story out of the bag! 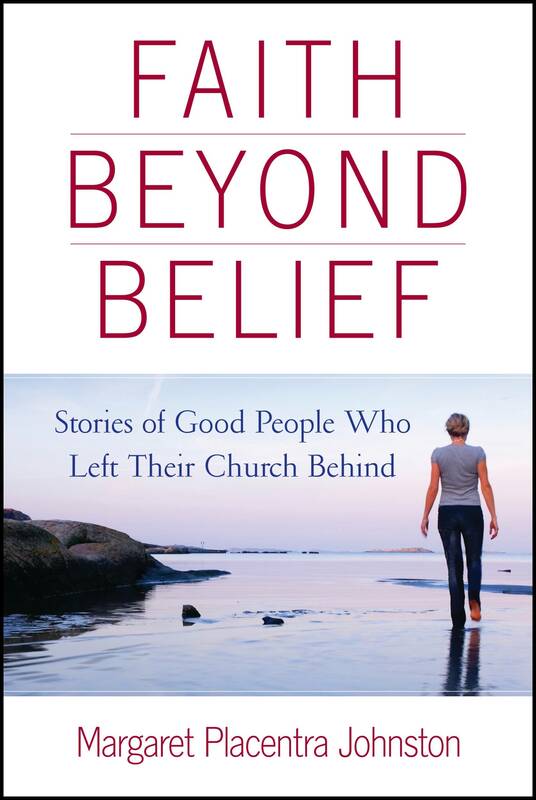 Faith Beyond Belief: Stories of Good People Who Left Their Church Behind is available on Amazon.com. Guest blogger Margaret Placentra Johnston, a practicing optometrist, is the author of Faith Beyond Belief: Stories of Good People Who Left Their Church Behind, Gold Winner of the 2013 Nautilus Book Award in Religion/spirituality. 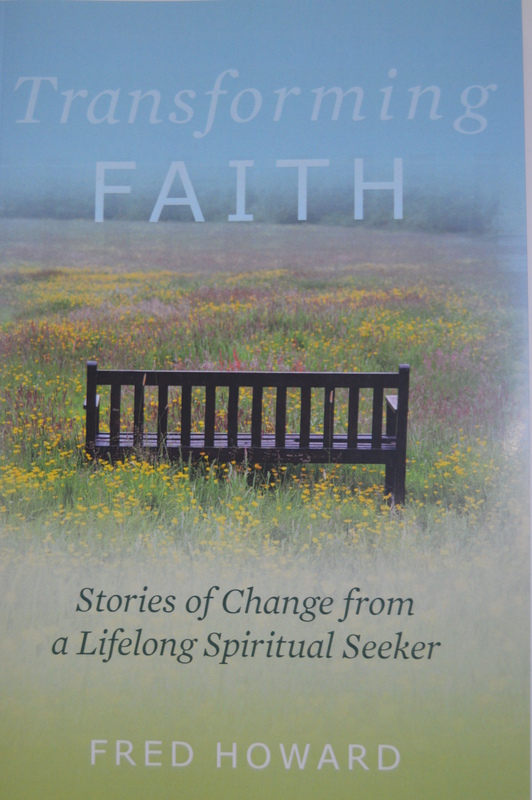 I was delighted for the opportunity to read and review Dr. Fred Howard’s timely new title, Transforming Faith: Stories of Change from a Lifelong Spiritual Seeker. In it, he mixes snippets of his own personal faith journey with spiritual development wisdom from the ages. He uses these tools to work his way through to one of the clearest and most inspiring articulations of postreligious, postconventional faith that I have heard yet. Howard’s book elucidates the spiritual development trajectory on three levels, his own personal journey, a synthesis of the stages other spiritual development theorists have described, and a trip through historical changes in religious authority that suggest our society in general is evolving through the same trajectory an individual might traverse. A literal Christian in his youth, Howard worked his way through the inevitable religious doubts that anyone honestly engaging with our increasingly postmodern world would encounter. He emerged, as do many people going through these stages, with a deeper, kinder and greatly expanded interpretation of Christianity (and faith in general.) This form of faith allows him to engage more authentically in the world minus the provincial and limited religious beliefs of his youth. Drawing on commonalities among the works of other spiritual development theorists, Howard refers to the earliest stage as “Adopted Faith*” common to most people in most traditional, organized religions, and similar to what he engaged in during his “born again” stage as a youth. Howard calls the middle stage Individuating Faith, similar to James Fowler’s Individuative-Reflective Faith**. Here, a person faces down the inevitable doubts the rational mind is likely to impose upon the literal beliefs taught in most churches. This honest open-ended questioning and critical reflection may involve risk of defection from the church. But the benefit is that it can lead a person beyond the spiritual infancy of Adopted Faith, and may result in an individuated form of personal growth that is rarely acknowledged in conventional society. The greatest gift of Howard’s Transforming Faith is in his articulation of the “final” stage. (I put the word ‘final’ in quotation marks because this is only the final stage we can articulate at this point. Spiritual growth is never finished, and we have no idea to what levels people may one day evolve.) He calls this Holistic Faith*** and says it is “a way of seeing life that [gives] wholeness, meaning and purpose to life,…better understood as a process….a verb rather than a noun…It’s an alignment of one’s heart with the heart of life and the heart of the universe.” Brilliant!! But Howard lends added richness to the spiritual development concept by mentioning how our understanding of religious authority has continued to evolve throughout history. During the first fifteen hundred years of Christianity, tradition was the primary source of religious authority. Truth was dictated by outer authorities, especially in the form of the hierarchy headed by the pope. With the Protestant Reformation in the sixteenth century, scripture emerged as the primary source of religious authority in the Western world. Together, these two eras may be seen as a society displaying a form of the Adopted Faith that is typical in the development of the individual. With the Enlightenment in the eighteenth century, the emphasis shifted away from outer authority toward greater importance on human reason as the more authentic determinant of reality. This era corresponds to Howard’s Individuating Faith stage. Transforming Faith serves as an excellent introduction to a hopeful and heartening view of individual spiritual development and overall societal human evolution, that has been articulated in many other books. Lest we be blinded by the “trees” of chaos and discord to which we are exposed through our conventional media, Howard’s perspective shares a glimpse of the “forest” – an optimistic future for humanity. **other theorists have called it the Skeptic, Individual stage, Critical Faith, the Rational Level, or the Critical Distance. ***referred to by other stage theorists as Mystic, Communal faith, Conjunctive Faith, post-critical faith, the Mystic level. MARGARET: What vision inspired your desire to write Transforming Faith? FRED: When I first learned of the stage theory of spiritual growth, it so resonated with me as a process which I was in the midst of at that very moment. It made so many seemingly disparate parts of my life fall into place. Since then I’ve wanted to find a way to share it with others. Writing a book that included significant turning points in my journey struck me as a good way to do that. MARGARET: How does your stance within Holistic Faith inform your work as a Unitarian minister? FRED: Unitarian congregations are really a microcosm of our increasingly diverse religious world and, as such, have the potential to model good interfaith relationships to the rest of our society. Being in community with self-identified Buddhists, Christians, Jews, and even atheists, as is the case in many of our congregations, requires we develop a Holistic Faith approach. The minister must think in terms of both/and rather than either/or. My goal is not to blend religions together. Rather, I ask the members of our congregation to remain steadfast in their religious identity. I encourage everyone to find ways to be true to themselves and yet still be in relationship to one another. As we find ways to creatively accomplish this we develop Holistic Faith. We grow spiritually as individuals and as a community. MARGARET: I know you are clear about this in your book, but for readers of Becca’s Inspirational Book Blog, could you supply a concise explanation of your view of God? FRED: The word “God” has different meanings for most everyone. But regardless of whether or not someone takes the notion of God literally, people with all varieties of spiritual sophistication still use the word to speak of a reality beyond the material world. So God, in essence, is a metaphor for meaning – a way for human beings to speak of something greater than ourselves, the great mystery of our existence, which gives life purpose. Heard in this way, it matters little whether or not God “exists” in any conventional sense. Thank you, Margaret, for this incisive review and interview. Transforming Faith is available now on Amazon.com.